Mitsubishi Electric has further developed its condition monitoring technology for predictive maintenance. The solution builds on the capabilities of add-on smart sensors by integrating them with an intelligent sensor controller for a more holistic approach to condition monitoring. The Smart Condition Monitoring (SCM) solution complements ‘traffic light’ alerts with detailed diagnostics, in-depth analysis and recommended actions to minimise unscheduled downtime and maximise asset availability. Increases in operating temperature, excessive current draw, changes in vibration characteristics and significant shifts in other operating parameters can all be indicative of impending problems in rotating machines. Condition monitoring based on vibration analysis was once the province of experts working with dedicated – and expensive – software packages, but the introduction of smart sensors has revolutionised condition monitoring. The introduction of sensors offering the most basic indication of a machine’s operating condition using a traffic light system of red, amber and green lights provided ‘at-a-glance’ monitoring. However, this simplistic approach limits the amount of information that is available for analysis, which denies the opportunity for practical recommendations to be made. The technology has now been developed to allow the sensors to monitor the full range of parameters, allowing this information to be interpreted to give an overview on the asset health of the plant as a whole. This approach has certainly helped large manufacturing businesses (where the cost of downtime can be highly significant) to schedule maintenance for key assets more effectively. Mitsubishi Electric has further built on this with the SCM Kit solution that uses the latest advanced FAG SmartCheck sensors for monitoring and feedback. The kit provides an integrated approach to monitoring the condition of individual assets, and enables a holistic approach to be taken to monitoring the asset health of the whole plant. Individual sensors retain the traffic light system for local warning indication at the machine, but at the same time information from multiple sensors is transferred over Ethernet to the intelligent sensor controller (this can be a Mitsubishi Electric PLC) for in-depth monitoring and more detailed analysis. 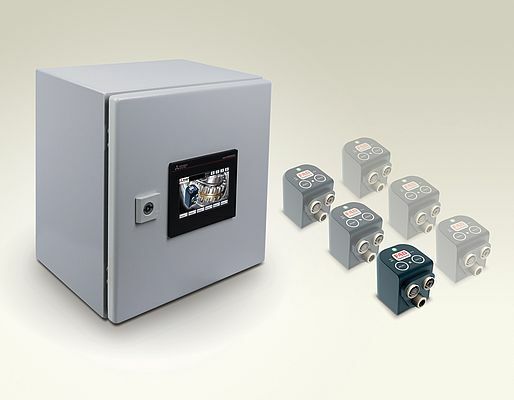 The SCM Kit provides a plug-and-play solution for machine condition monitoring. SmartCheck sensors can be added to machines as and where required, with a simple teach function allowing the sensor and controller to learn the normal operating state of the machine, generating a memory map of key parameters. Once set up, the SCM provides 24/7 monitoring of each asset, with functions including bearing defect detection, imbalance detection, misalignment detection, lack of lubricant, temperature measurement, cavitation detection, phase failure recognition and resonance frequency detection. Linking multiple sensors into the control system enables the controller to analyse patterns of operation that are outside the norm, with a series of alarm conditions that can provide alerts that attention is needed. The SCM analysis provides detailed diagnostics, offers suggestions for where additional measurements should be taken, and provides maintenance staff with more precise error identification. It even provides recommendations as to what rectification actions should be taken, with clear text messages presented to personnel. Further, this information can be networked to higher-level systems for ongoing trend analysis across all of the assets around the plant. Thus the SCM offers comprehensive analysis on the health of individual machines as well as a complete overview on the health of the wider plant. The result is vastly improved predictive maintenance and optimised asset lifecycle management. With maintenance able to be planned in advance, there is far less unplanned downtime and significant reductions in short notice loss of service.